Doesn't the summary of this book sound awesome? I sure thought it did. I was beyond excited to pick this book up - I was so sure I'd love it.Well, I'm not sure what the best way to say this is without being mean...but I really wish those characters and that plot had awoken in the head of a more seasoned writer. I feel like the way the story was handled absolutely ruined it. As engaging as it should have been...I never felt connected to anything. I really wanted to be! It just seems like the characters never had established personalities and the plot never felt fluid. I was so disappointed.The way Indians were treated in the past is a serious issue, and one that I love seeing written about when it is done right. The struggle between the Indians and the other townspeople in this story never took shape in a real way. There were a few instances of tension...but no real fight or resolution. I was very let down by that especially.Ellen and Tony seemed very interesting to me in the beginning, but throughout the book their personalities never seemed to cement. They would both constantly do things that I didn't think fit the character that the author was trying to establish (especially one scene where Tony acted in a way I didn't think appropriate to his previous personality at all). Those constant contradictions kept me from being as invested in the characters as I would have liked to be.Overall, I'm not sorry I picked up the book. I'm just sorry it wasn't written more clearly and didn't meet the expectations I had for it! Ellen Manery is a brilliant, science nerd who's most comfortable with her books and in the lab, not socializing with other kids her age. "Socially isolated," her teachers call her on her permanent school records. It's 1967, and when her parents decide to give up the rat race and move from Vancouver to Salmon Arm, where they have bought a resort on a lake in the middle of nowhere, she's convinced they've ruined her life. Sure enough, when she starts her senior year at the local high school, nothing about her fits in, from her height (she towers over everyone) to her dowdy clothes (the other girls are dressed in colorful mini-skirts) to her haircut and lack of make-up. And especially her academic interests--the counselor tries to dissuade her from taking advanced science and math courses, saying that they are too hard for girls and she should enroll in home economics and art instead. The only person at school who seems willing to talk to her is a dark haired young man, Tony, who like Ellen, is an outsider--he's the only Indian student in an all-white school. Slowly and carefully, Tony and Ellen develop a friendship, even though Ellen finds herself putting her foot into her mouth from time to time because of her ignorance of Indian culture. She helps Tony with his math, and he in turn teaches her to dance. They share their dreams--Ellen wants to be a medical doctor, and Tony wants to go to college and pursue a technical degree. Ellen soon realizes that she's attracted to Tony as more than a friend, and dreams of what his kisses would be like. But they are from different worlds--can they really be more than friends? I found this book by debut Canadian novelist Donalda Reid highly engrossing--in fact I read the entire book in one evening. The main characters of Ellen and Tony were well-drawn and convincing, and I was drawn into their story. In the U.S. we don't read or learn enough about our neighbors to the north, and I was happy to learn about the differences and parallels between how native populations were treated in Canada vs. the U.S. Ellen realizes that the Indians in Canada are not the teepee-living stereotypes portrayed in her history textbooks, and Tony realizes that not all white people believe all Indians are drunkards and lazy bums. The author also uses events happening in the civil rights movement in the U.S. at the time to highlight the similar injustices faced by the Canadian Indians. Sexism and the Vietnam War also play roles in the narrative. I thoroughly enjoyed this novel, with the exception of the very graphic scene in which Ellen helps to skin a moose calf (OK, I'm a squeamish urban girl!) The character of Ellen grows and changes during the course of the book, but in a believable way, and as the reader we can appreciate how she comes out of her shell, much like Mary Lennox in The Secret Garden, a book which is referred to multiple times in this novel. 'm not really the type of person who lives history, but there are some major events and eras that I do enjoy reading about and learning about. One of them is the sixties (a lot of it is for the music but that's totally besides the point.) When I saw this book was set in that era, I thought it would be up my alley.I was wrong.Ellen was a bit whiny and flat for me.. I'm sure if I ventured more into the story there probably would have been character growth, but I found myself skimming more and more so I just gave up on it. I do think the author is a good writer. The book was set up nicely, and knowing things like how Ellen was at first not going to be able to enroll in more academic classes because she was a girl really boggles your mind. At least it made me think of how far we've come in the world. I have seen a lot of good reviews on this book so I'm just going to go with: This was not my cup of tea, but if it sounds good to you, give it a shot. Pretty good book. I liked how it took place in the past, because it gave me a mini history lesson and helped me understand the 1960s a little better. It give me an inside perspective and made me feel like I was there, living in the 1900s and just observing life. I really liked the storyline. It was super cute. You have a girl, who wants to study science and be a doctor (which is super uncommon for women in the 1960s because they were usually housewives or low class jobs) and she does work at UBC, but her family decides to move to Salmon Arm, and she is out of place. There, as a misfit, she befriends another misfit named Tony who's a native indian, and he doesn't have any friends because at that time they were a heavily discriminated race. As per usual, the two misfits help each other feel complete and they end up being a great match. They learn about the other culture a lot, and have a newfound respect. Tony teaches Ellen a lot of the indian traditions and helps her understands the hardships his people face daily with lack of healthcare, lack of access to basic necessities like water, education, and he talks about residential schools. Ellen gets to know more about his family and the different issues they have, and she is inspired to be more open minded and understanding. Ellen also shows Tony that not all white people are as close minded as he was conditioned to believe, and they are two parts of the same puzzle. My only issue was that I found this book a little too simplistic. As you can tell, it's just the basic two misfits who come together and fall in love story. There was nothing super unique. I liked the Canadian setting, the Canadian history, and all of that, but I just feel like it was too simple and I wish the book were longer or there was more problems and conflict to thicken the plot. I also found it pretty boring near the end and it started to drag on once you understood the basic storyline because it's super predictable and even without reading every page, you would still understand the book. Ellen, a brilliant 15 year-old, about to turn 16, is focused and determined to reach her dream of being a medical research doctor. She has been taking accelerated courses in Vancouver... when all at once her world is rocked. Her parents inform her that they are moving to a resort town near an Indian reserve. Ellen is mortified and beside herself that she is leaving the school where her intellect and studies flourish. Once there, however, she meets and befriends Tony, an Indian who is a loner like herself. They become friends and the last year of high school is filled with a satification that she has never experienced before. Tony and Ellen help each other through the rough moments, the joys, and the unforgettable moments of teenage life. Their friendship blossoms into something more, and when it is time for both of them to go to the university, it is bittersweet...yet it is The Way It Is.I found this story to be just a plain outright delight. A YA romance with historical references that wasn't too corny or mushy. I loved both Ellen and Tony and their typical teenage 1960 voices. Their love story was a testament to the times...I found I was rooting for them throughout their senior year relationship.Thanks to Donalda Reid, Goodreads, Second Story Press, and Lauren Connor for this ARC copy. Based on the summary, this book sounds completely thought-provoking, interesting and engaging, correct? Honestly, I found the aspects of this novel surrounding racism extremely well done. I wanted to like this novel, but something about it was just very “meh” for me.At the start of the novel, Ellen is a character whose life revolves entirely around getting the best grades possible. She doesn’t have a lot of friends, and doesn’t make an effort to change that fact. Eventually, Ellen had a character arc and was willing to change, but this happened too slowly for me to feel passionate about this plot, because I was getting impatient. I wanted to love Tony, but his character just never clicked for me.The writing of this story was another thing that never clicked for me. It wasn’t anything particularly special. Sometimes the characters would drop in a “That’s the way it is” sentence which was a bit too obvious for me.While it had a lot of great content, I found The Way It Is poorly executed. However, I applaud the author for so boldly tackling issues of racism and feminism. I would certainly consider giving other books by this author a chance. Man, Ellen could be whiny, and the way she treat her parents really got on my nerves, but I can't completely discount this book as drivel. That wouldn't be fair at all. The way it dealt with feminism and racism was subtle, but it hit me hard. I didn't completely buy how naive Ellen was about relationships; then again, I like to think that people are born with at least a modicum of empathy in their systems. It got pretty romance novel-like towards the end, and I actually liked the pace of Tony and Ellen's relationship. Thing is, Tony, while I really wanted to like his character, rang flat for me, and despite what he shared, I didn't get as much of a sense for him as I wanted to. Loved the author's imagery, the way she painted landscapes with her words, but I think there was a bit of a problem with pace. Got me really psyched about graduation (two months away for me!) and got me longing for good old fashioned waltzing. Will elucidate on this further, when I sort of have the time. I love books about Canada, and this one fit the bill. It's set in the 60's which I love as well. It's what I loved about The Gathering, it's set in BC and it makes me want to visit these places. This book was so well written, I laughed out loud at some parts, and gasped in awe at others. Hardly any books make me do that lately. Loved it, glad I had the chance to read it. Though I do wish there was a sequel, just so I could find out what happens the next summer when Tony and Ellen are home again. Ellen grew too slowly though, I wish she could've made more friends instead of thinking since she was an 'outsider' that they didn't like her. Then again, neither parties gave each other a chance. The only person who was outright friendly to her was Tony. I loved seeing their friendship blossom, it was realistic to me, I loved that about it how it felt real while reading it. 3.5 stars.I really enjoyed this book. It was set in the 60s but was very easy to connect with for today's teens. I really liked the idea of someone finding out how bad racism towards native americans in Canada has been since that discrimination is often hidden away. I also liked seeing the main character develop as a person and overcome her shyness.It sends a powerful message about overcomning adversity and accepting others. I wish parts of it had been shorter; it did tend to drag on at some points. Also I wish I could have seen more what it was like for Tony living on the reserves. I'm a sucker for books with a strong sense of place, especially if it's a place I'm familiar with, and I liked this book a lot for that aspect at least. I'm not old enough to vouch for the accuracy of the historical information, but it rings true to me from what I know about the community. This is less true for the characters, unfortunately, although Ellen's isolation and insecurities were described well enough to be very convincing. The themes were perhaps handled a bit clumsily, but I can't fault the message. It was a good read but could have been better. i thought it was wonderful but i didnt want her to leave in the end they both deserved to stay with each other but i liked the concept of an indian guy liking a white girl it was racist but good. i like the way the author has talked about the confliction at that point of time using romance as the key to show love and anger throughout the book. overall it was a good read!!!!!!!!!!!!!!!!!!!!!!!!!!!!!!!!!!!!!!!!! and the book was and epic love story toooooo!!!!!!!!!!!!!!!!!!!!!!!!!!!!!!!!! I don't care what anyone else has to say, I loved this book and it is one of my favorites and has taught me so much in terms of what others think of me and how they can judge and how that should never stop you from accomplishing your dreams. The book description, focusing on racism in 1960s Canada, made me eager to read this, but the very flat, distancing writing style made it impossible to get drawn in. Couldn't push myself to read more than 100 pages, alas. The language and flow of this novel is somewhat stilted at times, however, the subject matter and how the characters deal with the complexities of prejudice and friendship make it a worthwhile read. Set in small town BC, GSS students could find it relatable. I really enjoyed this Forest of Reading book. It reminded me of a Canadian version of To Kill a Mocking Bird. I literally can not stand this book! I have no idea why it looked good on the back and it started of horrible and it kept getting worse and worse, the damn chick kept putting her foot in her mouth. Much better than I was expecting! It suprised me. Donalda Reid - Today, I’m a retired elementary school teacher and Principal with ancient degrees from The University of British Columbia - Bachelor of Education (Elementary), and Simon Fraser University – Master of Education (Administration). English and Fine Arts, my two academic majors, continue to be my focus. 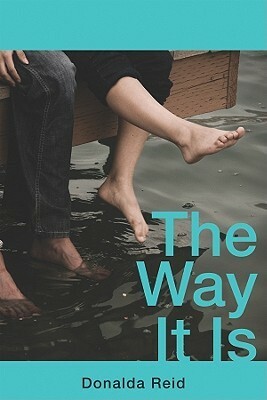 I spent my teen years and began teaching at twenty in Salmon Arm, the small rural community in the interior of British Columbia which is the setting of my first Young Adult novel, The Way It Is. The book’s world is drawn from my memory of that place, though the characters are a product of my imagination. As much as I enjoyed my thirty years working in schools throughout British Columbia, I love being retired. I paint and take photographs; I write; I travel. My first book, a memoir, Captive, a Survival Story, tells how I survived being captured by Rwandan Hutus when I was in Africa to see mountain gorillas. Many of the photographs I take are the inspiration for my drawings and paintings. I’m a member of the Federation of Canadian Artists and have displayed my drawings and paintings at the Federation Gallery on Granville Island, Vancouver, British Columbia. Coles Notes BiographyI was born. I went to school. I retired. Art and English were my best subjects in school, my majors at university, the subjects I taught and what I do now. If I were a cat I’d have six lives left. Writing books is how I investigate The Road Not Taken (Robert Frost, 1915).